It’s like they’re setting the stage for a bigger problem; is that so they can clamp down with a more draconian “solution”? “That creepy crawly recall of ground beef from a defunct Canadian processor has now expanded to all product in the past seven months. According to the Toronto Star, the recall started Feb. 18 and has been expanded eight times as the Canadian Food Inspection Agency continued its investigation. Click image to go to the mail story. 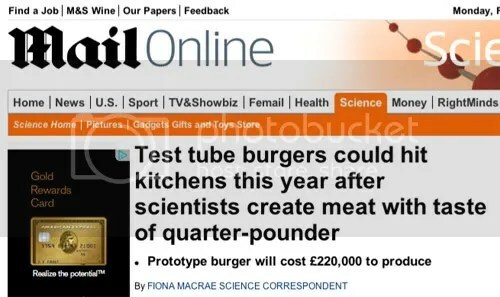 The world’s first test-tube burger will be ready to eat within months.